The Chinese government proclaimed a crackdown on road traffic safety in 2004, but traffic-accidents have not shown a decline. Car ownership in China continues to increase, with 126 million private vehicles in China by the end of 2014, a year-on-year increase of 15.5 percent, according to the National Bureau of Statistics. Nearly a third of the world’s 50 most congested cities are in China, with Beijing ranking 19th according to a traffic congestion report covering more than 200 cities worldwide. To help drivers abide by the traffic rules (or solve confrontations after car accidents), Chinese startups have emerged in the ‘telematic’ market. Telematics includes GPS systems and navigation systems, responsible for many features in vehicles. Weiche alarms the driver when there could be possible traffic signal violation, while Chengniu helps the driver after traffic prangs and crashes by intervening with an agent to solve disputes. Launched in 2013, Beijing-based Weiche offers traffic violation checks, smart drive recording, notification and warning of possible traffic violation while driving. The company launched the “Weiyouzhan” feature last September, to connect gas stations to driver’s mobile and provide convenient and discounted refueling offers. “Our ultimate goal is to became an operator of gas stations and a comprehensive service provider for car owners. Our online data, tools, and information will be seamlessly combined with the offline service,” Weiche CEO Xu Lei says. 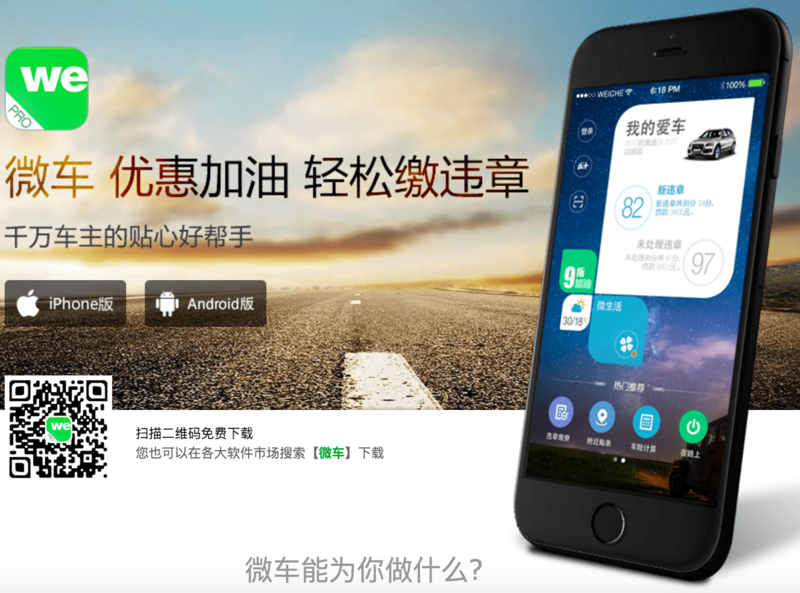 Chengniu is a car butler service platform for car owners born out of previously traffic violation consulting agency. The platform now provides traffic violation consulting, gas card charging, automobile insurance sales, road support as well as on-site maintenance services. The company pocketed a 30 million yuan series A last year from DT Capital, Rushan Venture Capital, Hangzhou-based Intune Capital and Ameba Capital. Another startup in this domain is Sijibang, an e-commerce platform which connects car owners and service providers. The car owner can send information about the car via mobile phone picture or texting. Service providers on the platform will set a price for the required service, so that car owners can choose any service provider based on their location, price, service quality. The app supports both iOS, Android phone. Last week, Italia-based Octo Telematics was said to be preparing for an IPO in the United States. The company makes technology for cars that allows insurance companies to monitor customers’ driving patterns and charge them according to their safety profiles. Weiche’s CEO Mr. Xue says the telematics market in China needs further development in the short term. “I see China’s telematics market is still weak in infrastructure. The user’s need for these services is not so significant at the moment as well,” Mr. Xu says. Digital telematic tech also requires more innovation. Using telematic tech, one can monitor vehicles through GPS systems and on-board diagnostics so that a cars’ location and speed can be detected and recorded. For example, London-based MyDrive offers end-to-end telematics for insurance companies, by delivering accurate and granular driver profiles to the insurer. “Telematic data usage is still in the early phase in China. Many just started to work on collecting sample data and data mining. The future telematic market is more likely to see B2B model-based data services, rather than B2C services,” he added.